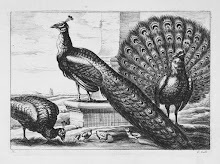 Currently, Epoca San Francisco's inventory includes an enchanting set of French posters depicting the fables of Jean de la Fontaine (1621-1695) illustrated by Benjamin Rabier (1864-1939). One of the nine panels tells the story of Le Singe et le Chat (The Monkey and the Cat) in which Bertrand the monkey manipulates Raton the cat through flattery to retrieve roasting chestnuts from their master's burning hearth. As Raton reaches for the nuts she repeatedly singes her paw but manages to pull the bounty from the cinders. Bertrand had promised to share the chestnuts but instead, he eats them all. When the master returns the pets are shooed away and Raton is left with a burnt paw and nothing to show for it. The moral of the story, the flatterer seeks some benefit at your expense. From the fable comes the English idiom a cat's paw meaning one used by another as a tool. For this reason, it became a popular theme for political cartoons. 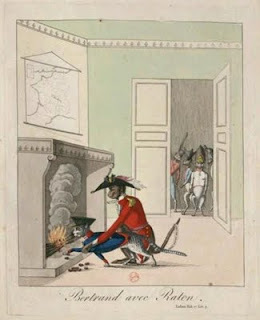 One such satirical view reveals a French red uniformed monkey directing a blue-uniformed cat in Bertrand avec Raton s'amusent à tirer les marrons du feu. 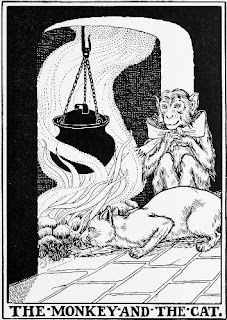 A 1900 black and white children's book illustration by Percy J. Billinghurst shows the cunning Bertrand anticipating the hot delicacy that the gullible Raton grabs from the fire.